When it comes time to put the family in the car and head out on a road trip, the 2017 Toyota Camry makes a great getaway car for Canada Day. 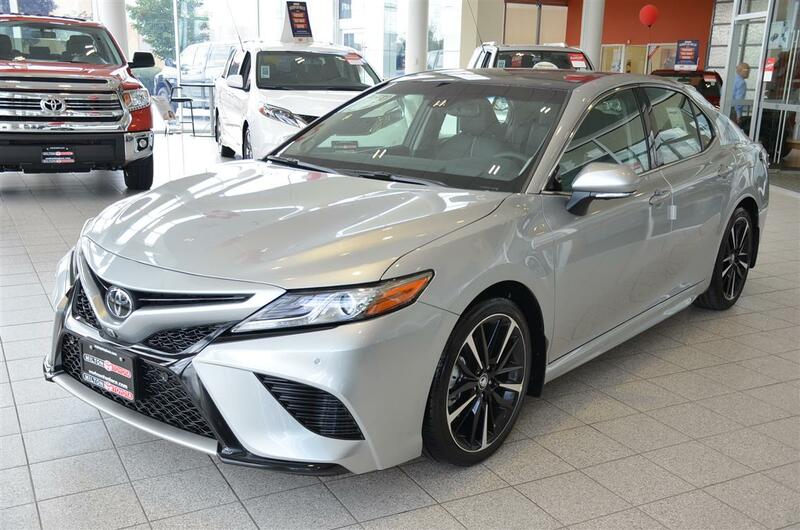 Once you get in behind the wheel of your Camry, you will notice that you are able to stretch your legs out and that your hands fit comfortably on the three-spoke steering wheel. Depending upon the model you choose, you may even have a set of paddle shifters for a sport feel and a leather-wrapped shift knob that puts you in control. In addition to legroom, everyone has headroom and knee room, so long trips are not uncomfortable. The ability to adjust your driver’s seat lets you change your position if you feel tired. Available 8-way adjustments for the driver and 4-way adjustments for the front seat passenger keep everyone relaxed. The seats are available in cloth or leather, depending upon the model you choose. For everyone’s comfort, Toyota offers available dual zone climate control for the front seat passenger and the driver. This lets everyone find a setting that they prefer. While out on the open road, the available power moonroof opens up the sky for all. This gives the cabin a spacious feel to it, and when open, it adds a comfortable breeze to circulate throughout the interior. It also makes nighttime sky gazing a lot easier. All of this comfort is good because the Toyota is equipped with a 2.5 litre 4-cylinder that offers great fuel efficiency. The Dual Variable Valve Timing with Intelligence delivers 178 horsepower at 6,000 RPMs and a 9.8/7.1 city/highway fuel efficiency rating L/100km. More miles mean fewer stops, so being comfortable lets you drive further. The Camry Hybrid saves you even more. It combines an electric motor with the 2.5 litre Atkinson Cycle 4-cylinder engine and has a fuel rating of 5.6/6.2 city/highway L/100km when equipped with an automatic transmission. If you decide upon a model that is equipped with a V6, you may see 11/7.8 city/highway L/100km from this 3.5 litre engine. No matter what you put under the hood of your Camry, you can expect great fuel efficiency and performance. The multi-mode 6-speed automatic transmission gives you a manual feel, and when combined with the paddle shifters, a much more exciting drive. Models that are equipped with a sport-tuned suspension make driving more responsive while never losing any ride comfort. Whether you are travelling from coast to coast or just off to a family bar-b-que, you want to remain safe, and Toyota has you covered. Blind Spot Monitors let you know if anyone is in your blind spot, Rear Cross Traffic Alert lets you back up without hitting anyone and ABS brakes help to prevent a skid. The Star Safety System™ consists of ABS, Brake Assist, Smart Stop Technology, Vehicle Stability Control, Traction Control and Electronic Brakeforce Distribution and comes standard on all Toyota Camrys. If you choose, you can add your own touch to your new Camry with Toyota accessories. From cargo liners to illuminated doorsill protectors, you can add another layer of protection to your vehicle. When making your plans for Canada Day, arrange to come by and see us. We will show you a new 2017 Toyota Camry and let you take it for a spin. Stop by today.